The front shows the crucified Christ between busts of The Virgin and Saint John, with the skull of Adam at the front of the cross. On the back is a standing figure of the Virgin her hands raised in prayer, flanked by busts of Saint Peter and Saint Andrew with Saint John the Baptist and Saint paul above and below. The names are quoted in Greek. Although now empty, the cross would have contained a relic - perhaps a fragment of the True Cross and would have been worn around the neck. The True Cross was believed to have been discovered at Jerusalem in the course of excavations for the foundations of Constantine's basilica of the Holy Sepulchre begun 325/6AD. Reliquary cross. Gold and cloisonné enamel mounted on silver gilt and hinged to open. The front plaque of the cross shows the crucified Christ between busts of the Virgin and Saint John; above are the sun and a crescent moon, and below is Adam's skull. A contracted Greek inscription in a thin gold strip is set on the edge in the enamel. Two empty triangular settings are located on either side of Adam's skull and a large circular hole has obliterated Christ's torso. On the back is a standing figure of the Virgin with hands raised in prayer, surrounded by busts of Saints John, Peter, Andrew and Paul with identifying inscriptions. These are translations for the ("somewhat bungled"- D.Buckton) inscriptions in thin gold stips which approximate to the conventional abbreviations for the above. Identifying inscriptions on the reverse of the cross. First recorded in the collection of Monsieur Debruge Duménil in a catalogue published by Jules Laberte in 1847. The cross was acquired shortly afterwards by Mr. J.H. Beresford Hope and when his collection was dispersed at Christie's in May 1886 it was bought for the Victoria and Albert Museum. Historical significance: Buckton describes the enamel work as crude and inexpert, and uses it to date the object. He notes that the translucent green used in the enamelled background is indicative of the first phase of Byzantine cloisonné enamel, from the end of iconoclasm in 843 to around the middle of the tenth century. Robin Cormack also uses the enamel to propose a date for the object. 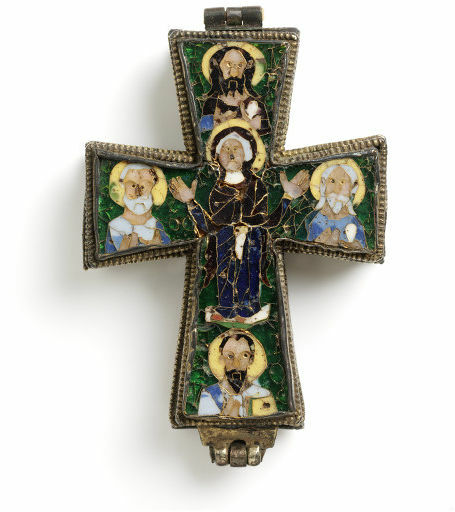 He cites the present cross as a striking example of new artistic expertise brought from outside of Byzantium following the final condemnation of iconoclasm as heresy in 843. Prior to iconoclasm Byzantine enamel work had been carried out using the filigree technique in which melted coloured glass was contained within loops of wire or metal strips. From the ninth century onwards Byzantine enamelling was done using the cloisonné technique: cells divided by thin strips of gold were filled with coloured glass and fired. When cool and fused, the surface was ground and polished. Cormack dates the cross to "soon after 843". The cross has been considered to be not strictly Byzantine, but Roman work, because of its resemblance to the reliquary of the True Cross, from the Sancta Sanctorum, associated with Pope Pascal I and now in the Vatican Museum. 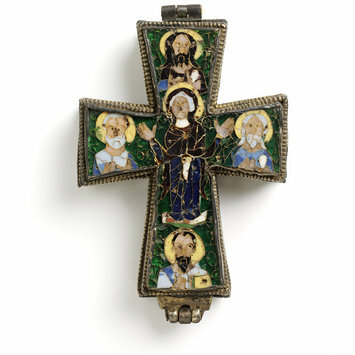 The present cross is now also compared to an enamelled box reliquary of the True Cross in the Metropolitan Museum in New York, the Fieschi-Morgan reliquary attributed to Constantinople and dated to the late 8th century. Buckton considers the present cross to be "less primitive" than the Metropolitan Museum reliquary but " less accomplished" than the votive crown of Leo IV (886-912) now in the Treasury of San Marco Venice. 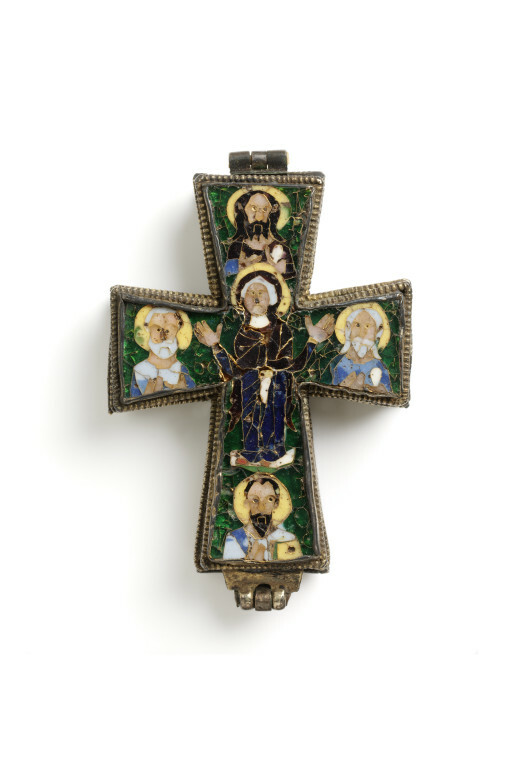 Robin Cormack has suggested that the immediate prototype for this variety of cross was the pectoral reliquary cross or phylacteries which were popular objects for iconophiles after the opposition to icons was declared heretical in 787. These sometime carried images and had the double power of expressing Orthodoxy and providing protection against misfortune. When iconoclasm was again pronounced a heresy in 848 this type of cross enjoyed a resurgence of popularity in which the present cross may have featured. The cross was made to house a relic, probably a fragment of the True Cross and would have been worn on a chain around the neck. The True Cross was believed to have been discovered at Jerusalem in the course of excavations for the foundations of Constantine's basilica of the Holy Sepulchre begun 325/6AD. Details of the role played by Constantine's mother Helena in finding the cross are not mentioned in Eusebius Life of Constantine and may be apocryphal. Veneration of the True Cross in Jerusalem is referred to in the Catecheses of Cyril of Jerusalem, dating the earliest reported practice to ca. 340AD. Although relics of the cross proliferated after this date they lost none of their spiritual potency and were frequently used as gifts between royalty and the upper echelons of the clergy : Radegunda, Queen of the Franks obtained a relic of the True Cross from the Byzantine Emperor Justin II, in 569 and Gregory the Great (540-604) sent a portion of the Cross to Theodolinda, Queen of the Lombards and another to Recared, the first Catholic King of Spain.